Sydney Shop Girl: 'Til It Happens To You. There were some stunning frocks on the red carpet last night, with Cate nailing her outfit with her usual grace and style. But to me, the most powerful moment of the night belonged to the men and women who shared the stage with Lady Gaga as she performed 'Til It Happens To You' - a song Gaga co-wrote for a documentary about on campus sexual assault. They represent the survivors of sexual assault in all its heinous forms. The arms of the survivors were tattooed with the phrases, "unbreakable" and "it's not your fault". The acknowledgement of victims of sexual assault was a theme that ran deep through the night. Many of the nominated films had assault and the plight of victims at their core. 'Room', based on the book of the same name details the lives of a woman held as a sexual slave and the child she delivered and then mothered as a result of that abuse. 'Spotlight' tells the story of the newspaper reporters who uncovered the shocking abuse children endured at the hand of the Catholic church in Boston. The taboo, shame and secrecy surrounding this abuse protect the perpetrators and allow them to act with ever increasing audacity. Film and the celebrity that accompanies Hollywood has such a huge currency in our world. To have a global event like the Oscars confront the abuse and rise up with its victims is monumental. Perhaps in some small way, any victims who were part of the night or have been reading about it in the media will truly feel that they are not alone, they are not at fault and that people stand with them in acknowledging the abuse. And may that unity elicit a change in the way our society treats victims. 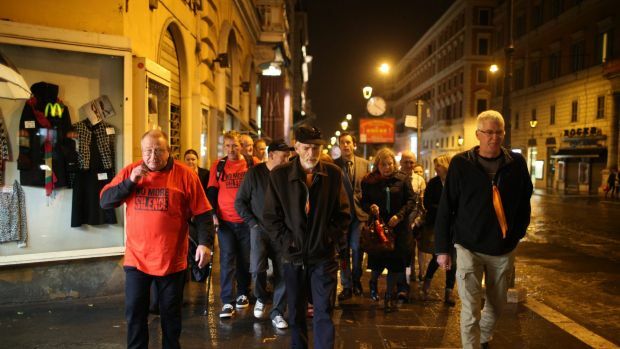 Survivors of Catholic child abuse in Ballarat, in Rome to hear Cardinal Pell's testimony. Meanwhile, in Rome. Where an awful lot seems to have been 'unable to be recalled'. And the usual suspects in the media have seen it fit to stir further controversy and hatred within the Catholic church at the same time that many victims are in Rome to hear the evidence and to move forward with forgiveness and a hope that the church will change from the top down in getting rid of paedophiles within its ranks. I've found it very difficult to follow the stories and evidence being put forward in the current royal commission into institutional sexual abuse. I listen and read as a parent and also as a person who has seen through my work the devastating and permanent damage abuse burns into every facet of the lives of its victims. However, the stories of hope, courage and resilience that have been told in relation to the commission have made me wiser as a parent and hopefully more compassionate as a person and clinician. Of course over here we've had the Saville issue. Goodness I sooo wish he was alive to witness his destruction rather than dying having thought he'd got a way with it.